Let's face it, when you have been blogging for a long period of time (September will be 4 years for me), you start to run out of the creative post ideas. Sometimes it's hard for me to either organize my thoughts and expand on a particular one, or it even can be difficult to get around writer's block. It happens. To help me in those times, the one thing that I am always carrying around with me is a notebook. In that notebook, I usually write down all of my post ideas. From the very detailed post idea: "how to create a printable with Canva", to the obscure & needing brain power to make it happen post idea: "monthly beauty favorites", and in between, all my ideas are generally written down in that notebook. So it's a handy notebook, huh? 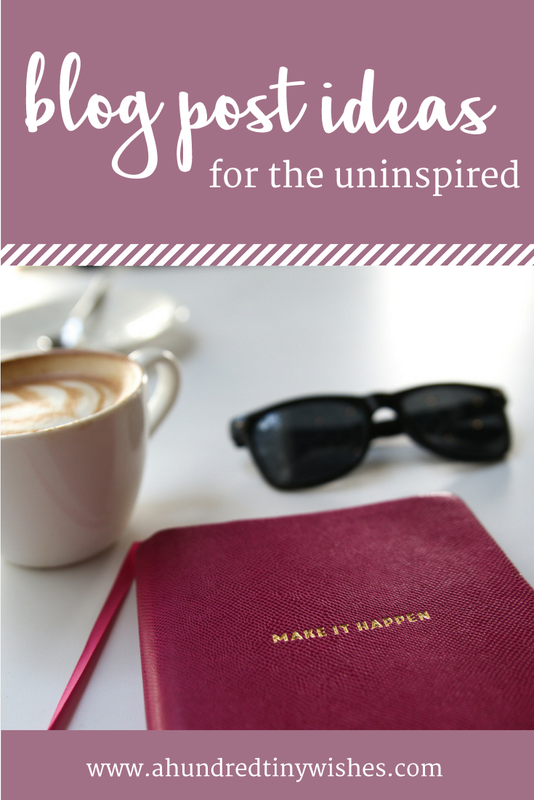 Today I wanted to open up my notebook and give you 60 blog post ideas that you can use in times that you are in need of inspiration. I hope this help in times when you need inspiration. Oh, btw do you have any blog post ideas that I can add to the list?